October is Women’s History Month in Canada. It is a time for Canadians to celebrate the achievements of women and girls as trailblazers throughout our history. It is a time to learn about the contributions women have made that have shaped our way of life. It is a time to recognize that “Because of Her” Canada is the extraordinary country that we know today. A lot has happened in our history and women have been there from the beginning, working, innovating and striving to make Canada a better place for all. Much of our progress as a nation is the work of remarkable women, who pushed for change, even in the face of intractable social barriers, discrimination and resistance. Because of these women, we are all a little closer to gender equality. During Women’s History Month 2016, we are recognizing the women who have shaped Canada’s history — as activists, leaders, artists, academics, and entrepreneurs, to name a just a few. We are celebrating their victories and acknowledging the enormous challenges that they overcame. We are retelling their stories and inspiring the next generation of Canadians to carry on the important work that still needs to be done to achieve gender equality. Who’s shaped your history? 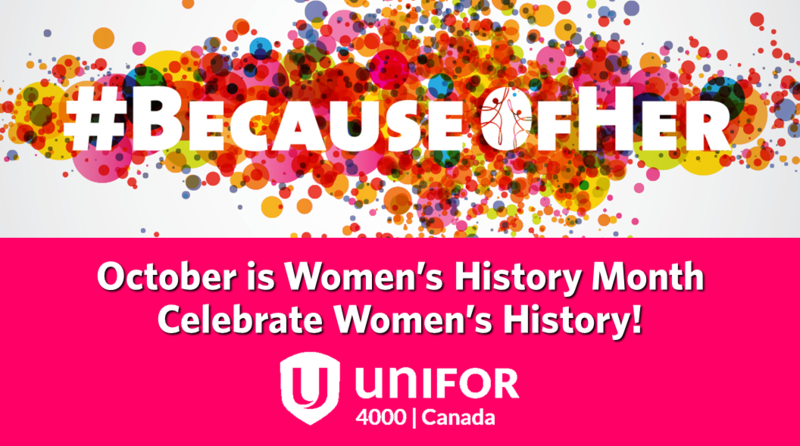 Tell us on social media using the hashtag #BecauseOfHer. Show us how extraordinary women - past and present - have influenced your life by sharing a status update, picture or video. Share our profiles of notable Canadian women and show the whole country the countless ways that women have contributed to our country.